RIO DE JANEIRO : At least seven people were killed in a confrontation with police in Rio de Janeiro’s Rocinha favela on Saturday and several others were injured, as an army takeover of Rio’s security services drags well into its second month. The police said the incident began when a patrol was attacked, though family members of those killed disputed various aspects of that account, according to interviews given to local media. 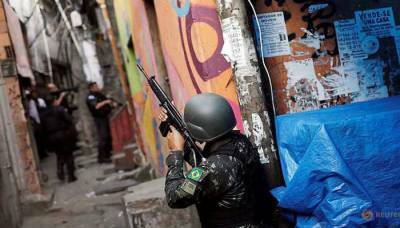 The police said that they had entered Rocinha to search for suspects in the killing of a police officer in the slum earlier in the week and that they recovered various weapons following the incident, including a pair of grenades. In mid-February, Brazil’s federal government ordered the army to take command of security forces in Rio de Janeiro in a bid to curb violence driven by drug gangs. The already violent city has seen an uptick in crime in recent years. Murders climbed eight per cent in 2017 from the year before and 26 per cent over 2015. Shootouts are a daily occurrence in Rio’s poorer areas, and the violence has increasingly spilled into Rio’s more affluent neighbourhoods. Drug trafficking in Rocinha is controlled by the Red Command, Rio’s most powerful drug gang.